Is it true that well-regarded representatives of the business world are often surprisingly ineffective as members of nonprofit boards? Do they seem to have checked their analytical skills and their “toughness” at the door? If this is true in some considerable number of cases, what is the explanation? Are Bowen’s observations about directors’ questionable motivations for accepting director positions still applicable in the 21st century? He noted that some nonprofit directors accept board positions because they are dedicated to the organization’s mission, vision and values. But he also hypothesized that business leaders are sometimes motivated to join nonprofit boards for a variety of other reasons. They may regard board membership as a “vacation from the bottom line … or the enjoyment of a membership in a new ‘club’.” Also they perhaps join nonprofit boards to “soften” community perceptions that, as tough bottom-line executives, they also may care as much about human issues as they care about shareholder returns. (It would probably be costly or impossible to obtain objective data of this observation.) Press reports through the years, since 1994, have indicated that such attitudes still hold leadership sway in nonprofit organizations. Two examples of how permissiveness, apparently may have led to a relaxation of board responsibility:** In 2009 and 2012, two nonprofits (a YWCA and a youth center) declared bankruptcy. For several years prior to this event, both boards had ignored the “Red Flags” signaling budget problems. Evidently a permissive standard had existed, not holding budget planning to rigorous standards. The two groups, I assume, avoided seeing the signals because a permissive culture might have been in place, and thoughtful business leaders might have been co-opted by this relaxed culture. Today, any experienced nonprofit director has probably encountered senior business leaders which don’t thoroughly apply their analytical skills in making decisions in a nonprofit environment, mainly rely on management for analysis, and seem to enjoy being overly concerned with operational minutiae. My own early experience with board permissiveness occurred when I became a member of a board of a nonprofit responsible for a $12 million budget. Members of the board’s audit committee included volunteer directors employed by accounting firms. At the time, as it is today, it was common practice during discussions with the external auditors to have an executive session without management present, so the committee members could ask the external auditors for confidential appraisals about persons handling financial affairs and ask additional questions about the completed audit. (Example: Was management fully cooperative in providing audit information?) The nonprofit did not adhere to this practice, which could lead to IRS concerns, if audited. The knowledgeable auditors on the committee did not think the practice necessary for a nonprofit. This was permissiveness in action. 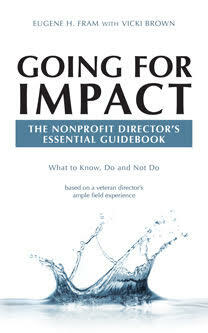 ** See blog-site “Nonprofit Board Crisis” for a backlog of similar field examples to those presented here.